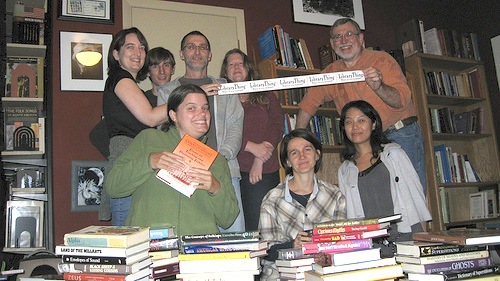 Once upon a time, this hearty group of library students from the University of Illinois (my alma mater) came together to finish up flash-mob cataloging the folktales collection of storytelling professor Dan Keding. They had started in the spring by cataloging 600 books, which was less than half the collection. The final count was 1,413 books, which you can see in Dan’s LibraryThing catalog here. 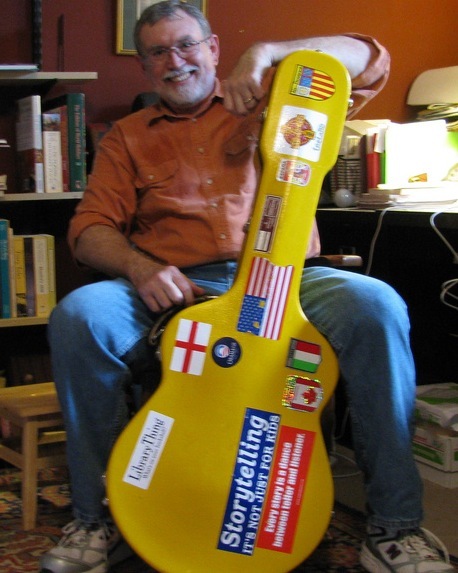 Dan is also a LibraryThing author, with several folktale books of his own. In addition to cataloging the collection, the mobbers added Mylar covers to the dust jackets. The books in the collection are available to students taking the storytelling course. See more photos of the flash mob here. While getting my library science degree I took this class, and used books like these for finding stories to perform, as well as information about the history of various stories and storytelling. I’m happy students will have an even larger collection – as it turns out, finding stories you want to tell isn’t as easy as you’d think. Dan’s guitar case now boasts a LibraryThing sticker. LibraryThing now boasts a new member with a large folktale collection. Students can now see the collection online. We all lived happily ever after.